I have come across a secret ingredient in waffles that provides a WONDERFUL texture… What is it you ask? Well, if you haven’t guessed by the title, I’ll tell you! It’s CORNMEAL! My parent’s neighbors shared this family recipe of theirs and my mother has deemed it her new favorite waffle recipe. The buttermilk makes these waffles delicious and fluffy while the cornmeal makes makes each bite crisp and incredible. They really are so good! Give them a try for yourself- Once you have tried them, they just may become your new go-to recipe too! 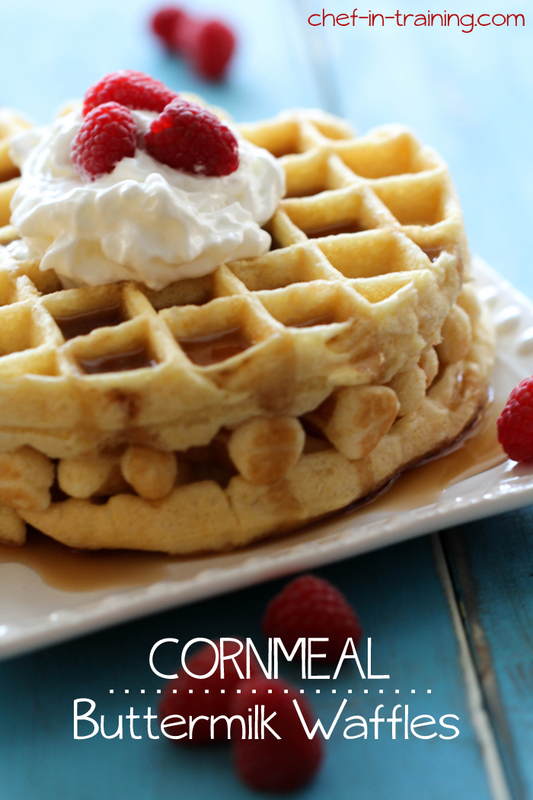 I love cornmeal in pancakes, but never thought to try it in waffles. I must try these asap! Cornmeal in pancakes is my favorite secret ingredient. I know I would love these too. Yikes! Mine are sticking in my Calphalon waffle maker. Add more oil? I doubled the recipe, if that makes a difference. I love cornmeal pancakes, so I'm sure these are even better! I want to eat one just dripping in honey.